PX4IO is the Input / Output module for fixed-wing aircraft and rovers with four relays, servo failsafe and manual override. PX4 is an expandable, modular system comprising the PX4FMU Flight Management Unit (autopilot) and a number of optional interface modules (including PX4IO and PX4IOAR). 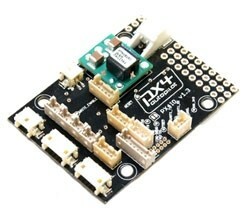 24 Mhz Cortex-M3 failsafe microcontroller. 6-18V input, 5V / 2 A output. 8 high-speed servo outputs (up to 400 Hz). Futaba S.Bus compatible servo output. PPM, Spektrum and Futaba S.Bus compatible receiver inputs (sum signal format, all channels on one connector). 2x 0-40 V, 1 A solid-state relays (MOSFET). 2x 5 V, 500mA current-limited, switched 5V power outputs. Analog port with voltage divider (differential pressure sensors). PX4 Expansion bus (stacked on PX4FMU). The kit includes four nylon spacers, a power connector (not soldered), 3x9 pin headers, 3x4 pin headers and a power cable that can be soldered directly to the board or to said connector.